← Yeni Cami, New Mosque meets 350 years ago. One of the symbols of Istanbul is this tower almost 70 meter high towers over the district of Beyoglu, on the north side of the Golden Horn. In that place, with Constantinople, There was an old Genoese colony that declared itself neutral during the siege of the city and did not help the Byzantines against Ottoman attackers. In appreciation, Mehmet the Conqueror allowed its inhabitants to keep their homes, business and property. This affluent neighborhood of foreign traders is now a lively cafés, art galleries and small hotels in the center of the monument from which you can admire the spectacular views of Istanbul is. If you do not understand the geography of the city, see from up there as lying on two continents. Lovers enjoy the panoramic photos a while from the lookout tower. In the area there was a tower from ancient times, in 528 and there was a lighthouse near the present location. Later, the Byzantines built the Megalos Pylos, great tower, holding one end of the huge chain that closed access to the Golden Horn. The Megalos Pylos was destroyed by the Crusaders in the sack of Constantinople 1204. The Galata Tower as we know it today was built by the Genoese in 1348 in a different place from its predecessors and originally called Tower of Christ. Measures 66,9 meters, 62,69 without the kick. The viewpoint is 51,65 m height. It is a magnificent building with a diameter at its base 16,45 meters and stone walls have 3,75 meters thick. The tower was part of the citadel which housed the Genoese colony on the other side of the Golden Horn. Precisely because it is situated on the opposite side to Constantinople, the area was known as Pera which in Greek means “other side”. 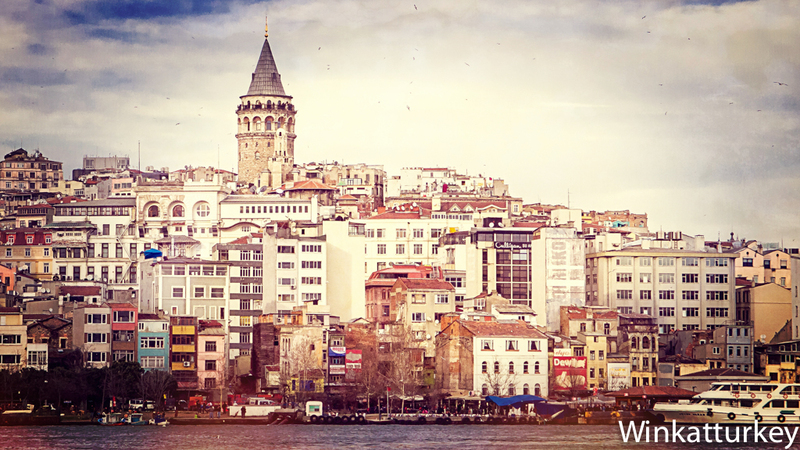 The neighborhood that reaches Taksim Square is still called today Pera. The Genoese were granted permission to settle the Byzantine Empire and trade, they even have their own governing. However, also had very good relations with the Ottomans and had established trade agreements with them in several areas of the Aegean, as the monopoly of trade alum Manisa. During the siege of Constantinople, the Genoese were neutral and after the fall of the city, Mehmet ordered the colony and its inhabitants were respected. There was no looting or slaves were taken, course, Mosques became the two great churches but were allowed to continue other open for worship but with the prohibition to touch their bells. The properties of those who had fled were inventoried and gave a deadline for them to go back and retrieve. Many did. Of course, Turkish governor appointed but the population remained foreign. Over the centuries that followed, international tradition of the area is maintained and the neighborhood was home to most of the foreign colony and the embassies of the various European countries to the Sublime Porte. For his part, The tower had various usages, from the defensive to the watchtower of fire. The ground floor of the tower were used many times as a prison. One of the most curious episodes that took place in the building's history was the starring Ahmet Çelebi Hezarfen. In 1632, This Ottoman scientist used a wood and fabric wings to fly over the Bosphorus from Galata Tower to Uskudar. On the seventh floor of the building, a plaque commemorates this amazing flight 3,4 kilometers that he earned his protagonist Sultan of reward as a sack of gold coins. Like other scientists and innovators, was the subject of snares by the most immobile sectors of society, religious authorities branded him a heretic and dangerous Sultan himself had rewarded him banished him to Algeria, where he died shortly after. The visit to the tower may be accompanied by a nice walk in the streets that surround it and the views from the lookout allow us to see almost the entire city, including the start of the Sea of ​​Marmara, the Bosphorus and the Golden Horn. To climb the tower you have to do a lift and charge for it. No Allowed Muzekart. It is open 09:00 to 17:00 in winter and summer to 19:00, should check the schedule at our hotel before going. Thanks to Cristina for the photos.